As the outdoor temperature creeps higher and higher its time to start thinking of ways to cool off, and what better way then to savor something cold and sweet. 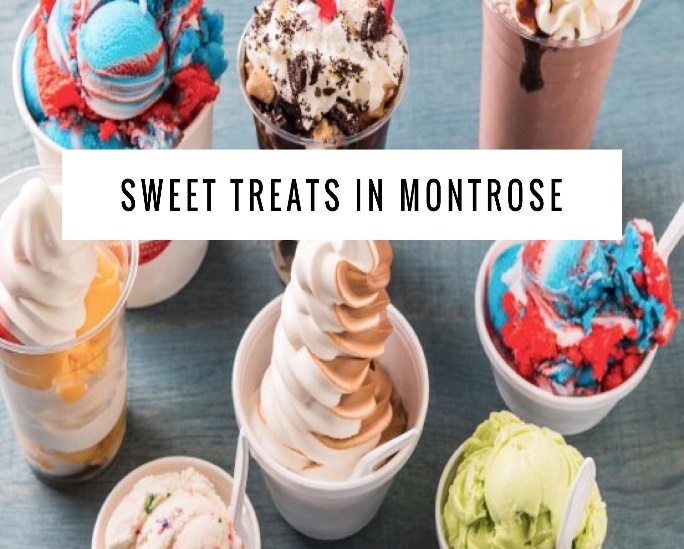 Montrose has some tempting sweet shops that will delight those young and old. Love chocolate and ice cream? Then head on over to Russell Stover on Townsend Ave. This shop literally has something for everyone. Russell Stover’s is famous for their chocolates and in this store, you can buy a wide variety, from candies to mouth watering fudge and even candy apples. Their ice cream selection is sure to please any ice cream aficionado. You can choose from traditional sundaes, milk shakes and soda floats. If you prefer coffee, then try their fully stocked espresso bar and enjoy a hot or cold coffee or hot chocolate. If you like to customize your ice cream and watch it made in front of you then you will love Cold Stone Creamery. Located on 5th Street Cold Stone’s is unique in that customers pick the flavor of ice cream they would like and then choose sweets to mix in such as candies, chocolate syrup, fruits and nuts. Watch then as your creation is folded over and over on a frozen granite slab. Cold Stone also offers ice cream cakes, and ice cream cookies too! Soft serve ice cream fans can head on over to Dairy Queen on Townsend Avenue. This go to spot not only carries tasty soft serve ice cream but delicious banana splits, brownie sundaes, smoothies, iced coffees and the famous Blizzard which is a mix of soft serve ice cream and blended candy treats. Some one in your party not in the mood for something sweet? Dairy Queen has quite a large menu offering burgers, chicken, fries and much more.